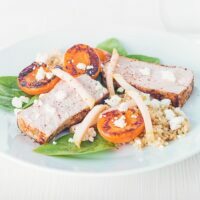 Good food is all about combinations and this Seared Apricot, Roast Pork Loin with Feta & Pickled Kohlrabi rocks the whole sweet sour salty vibe with perfectly cooked pork. 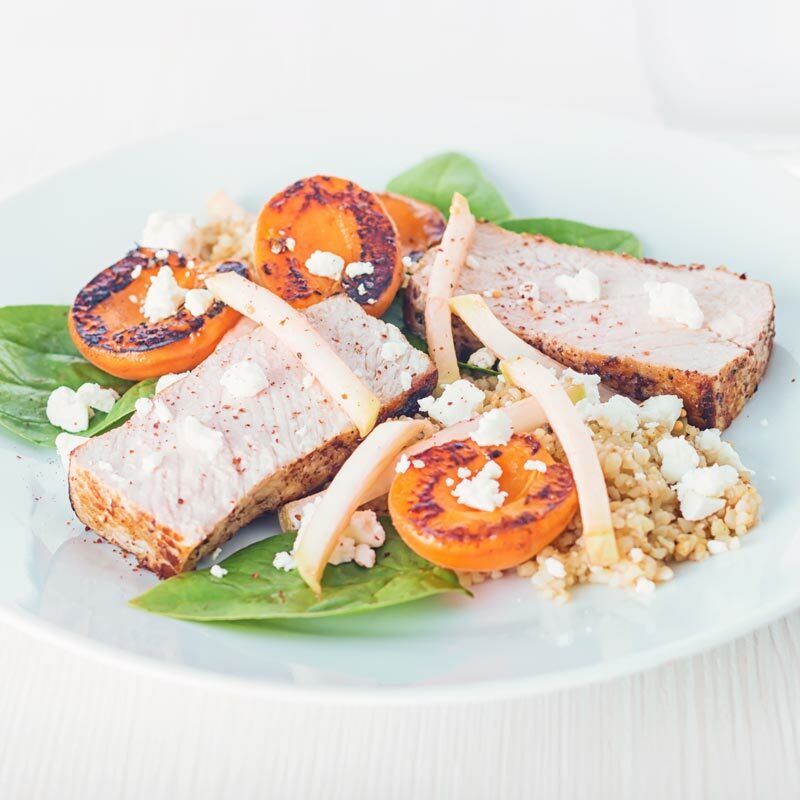 Seared Apricot with Roast Pork Loin with Feta Cheese and Pickled Kohlrabi. This simple roast pork loin recipe very much relies on the choice of ingredients and simple cooking techniques. Cooking is most definitely not difficult and no matter how fancy some of my dishes look they are all achievable in the most modest of kitchens. A recipe is really nothing more than a few good things that work well together. This pork loin recipe joins a whole load of recipes similar to this one. They are all built around a whole series of complementary ingredients working in harmony to create a meal. Check out my ham hock ‘salad’ or orange and harissa salmon recipes for stuff that is similar. Here we concentrate on sweet, sour and salty flavour combinations sat alongside a perfectly roasted piece of pork loin. Roast Pork Loin For Two. My whole site is primarily focussed on cooking for two. Most of the time the phrase ‘roast pork’ would be associated with a much larger meal. It is however perfectly possible to roast pork, or indeed any other meat on a much smaller scale. In many ways, it is an identical process to roasting a larger cut of meat. It is also the identical cooking technique I use in my pork loin with carrot recipe. You just have to be a bit more accurate with your cooking temperature as there is not as much bulk. But grab yourself a meat thermometer and you will be fine. I really do not have a sweet tooth at all but if we are playing a game of word association the pork is synonymous with fruit. Whether it be with apricot like we have here, or pork with prunes, pork with pineapple or even pork with Watermelon it is definitely my kind of food. When it comes to pork it is so complimentary of so many different fruits. Here is a list of fruits that I think really well with pork. Personally speaking, the one notable exception is pork with citrus fruit, I just do not like it. 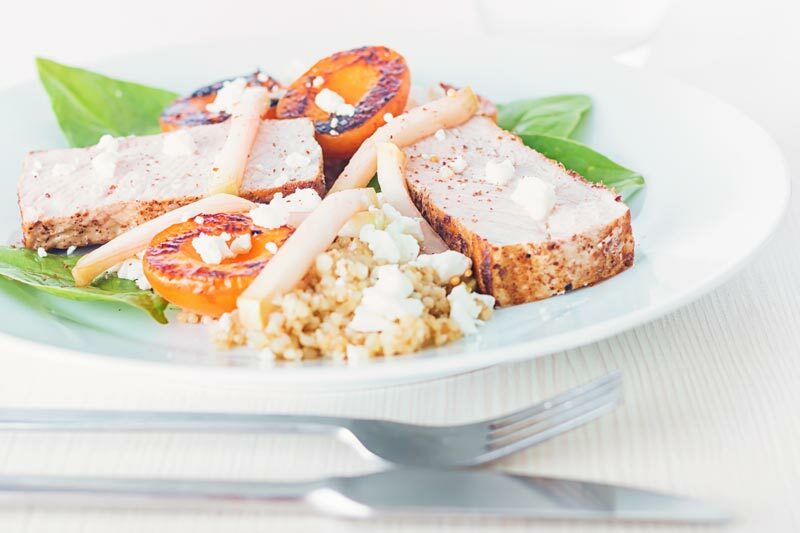 Roast pork loin is the perfect foil for sweet, sour and salt flavours and this simple recipe for two combines, pickles with cheese and fruit. Classic combinations with a twist! Cut the apricots in half and remove the seed. Cut the kohlrabi into batons around 5-7mm in profile and around 4-5cm long. Bring a pan of salted water to the boil and a cook the bulgur wheat, this should take around,15 minutes. Rub the pork loin with cooking oil and generously season with salt and pepper. Heat an oven proof frying pan and when hot add in the pork and sear on all sides. When seared add the butter to the pan and transfer to the oven and cook at 180°c until the internal temperature reaches 62°C (approx 25 minutes). Heat the red wine vinegar, sugar, mustard seeds and 1/2 teaspoon of salt in a pan until the sugar melts and the pour over the kohlrabi batons and pickle for as long as it takes to bring the rest of the meal together. By now the bulgur wheat should be cooked, drain and set aside. When the pork is cooked remove from the oven and dust with the sumac all over before tenting with foil and allowing to rest for 10 minutes. Take the pan that the pork was cooked in and place it on a medium high heat and when hot sear the apricot cut side down for 60-90 seconds. Remove the apricots and when the pan is still hot but off the heat add in the bulgur wheat and stir to get all the goodness from the bottom of the pan. Go for relatively small apricots, around 35g each. 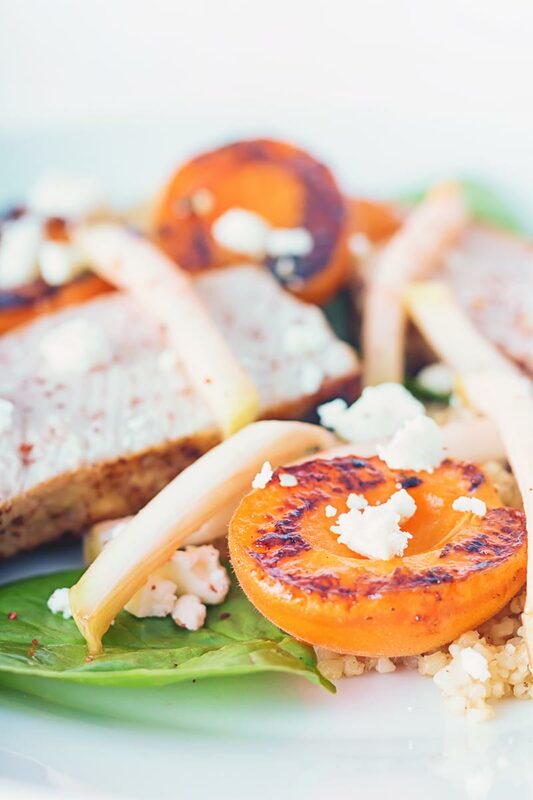 My mouth is watering at the thought of the charred apricots and fetta combined with the pork! A gorgeous dish! Pity summer in Australia is still so far away. Love the look of your blog and what you are doing. This dish just screams summer love. 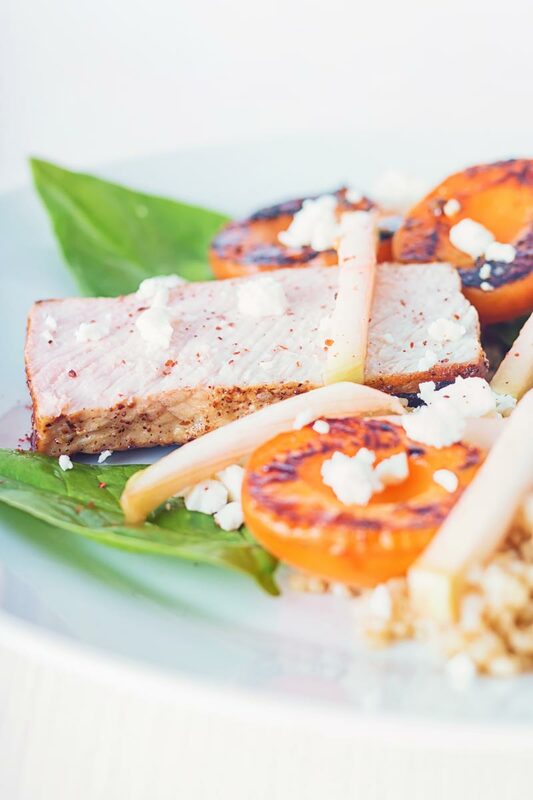 Pork, apricots and feta are a match made in heaven. Love the char on those apricots!! Will be making this when they come into season in Australia, hello summer!! The apricot and feta combo sounds divine! This is definitely something I need to try. It really does work so well. Definitely, such classic flavour profiles. This all looks like a tasty plateful but I’m particularly keen on the sound of the lightly pickled kohlrabi. The Kohlrabi is particularly good.